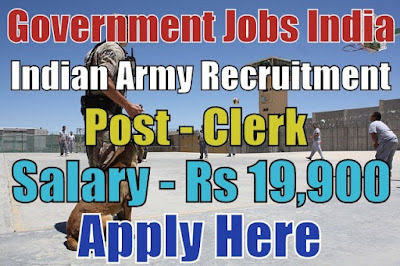 Indian Army Recruitment 2018-19 (Ministry of Defence, Government Jobs in India) notification for Various clerk, tradesman, assistant and various posts. All legible and interested candidates can apply on or before (30-10-2018). Further information about the Indian Army recruitment careers and exams, vacancies, salary details, MOD careers, application fee, defence recruitment, fresher jobs, Indian Army government jobs in India, job after 10th, educational qualifications and all other details/information about these posts are mentioned in details below. Last Date for Submitting Application Form - All candidates must apply on or before (30-10-2018). After the last date, no application form will be submitted. Application form can be submitted via offline only.